Jay-Z didn't get one of these in his gift bag. 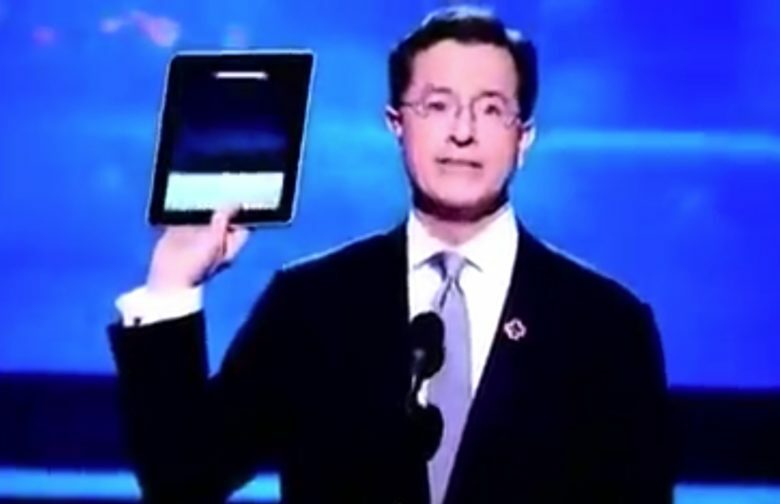 February 1, 2010: The tech-loving world goes into meltdown at the sight of Stephen Colbert using a prerelease iPad to read nominations during the Grammy Awards show. The celebrity sneak peek is all part of Apple’s big (and wildly successful) plan to hype its upcoming tablet computer. Steve Jobs had just shown off the iPad publicly for the first time a few days earlier on January 27. Since Apple’s secrecy ensured that virtually no outsiders had seen the iPad by the time it was unveiled by Jobs, the deal with Colbert came about incredibly quickly. It’s a reminder of just how cool the original iPad appeared at the time. And how — unlike stunts such as Samsung’s mass selfie with the Galaxy Note a few years later at the Oscars — it felt like a genuine moment, rather than a bit of viral marketing. Colbert is, of course, a massive Apple fan. Do you remember the iPad’s exciting debut? The first-gen iPad went on sale a few months later on April 3. It became the fastest-selling new Apple product line of all time, taking less than a month to sell 1 million units. And it went on to sell around 25 million units in just over a year. Do you remember the iPad’s night out at the Grammys? Leave your comments below.